I wish I had that resource.. the only place I found willing to do the job was a Lab, normally dealing with some VERY high tech armatures and rotors. Some of that is due to starting weight. But most of it is the different ways i have reduced weight, where and how far I cut. The rest of the differences are accounted for when I turn the OD down, the width down, or both. This example is 138mm in Dia, 10.5 wide. 6lb 2 1/8oz final wt. I can take a few more mm off the width, but it makes the lip that locates the sprag clutch a bit thin. 9.5mm wide is as thin as i'll go. Diameter can go down to 136.5 But any farther and you start getting Very close to the basket. and I prefer to not let the tool cut into that. On the back side (toward the motor) I cut 4mm from the width and down to 118mm dia. and skim cut the basket 1.25mm from the radius at the motor side to 2mm from the outer edge. I did not cut all the way to the edge, due to the timing markings that are stamped there. So the engine revs quicker? Any downside? The throttle is a little more sensitive (could be considered jerky). The flywheel is basically just a spinning weight so it makes the throttle transitions smoother by slowing them down a little bit. This goes for accelerating and decelerating. When you snap it open, the bike will open up quicker, as well as engine brake quicker. This is in a way less "tame" and harder on things like the sprockets, if used improperly that is. And arguably less safe in some ways too (snapping the throttle open mid turn for instance), so I'm guessing companies like Honda stay on the side of a little too much weight on the flywheel than too little. This can all be overcome with a little focus on the throttle control. So if you use it correctly there is no downside. It's quite fun if you like being part of controlling the ride. Not arguing 7mores7's points in general.., but just saying on THIS motor, much of what he points out is not what is noticed by those that have used a lighter flywheel ON THIS bike. The VTR motor has a ton of rotating crank weight,, dropping 1.2 lb from the flywheel does not exhibit the nasty tendencies outlined by 7more.. but you do get the faster spin up. I only have 6000 miles on a light flywheel, mostly street, some highway, some faster stuff... and I have not experienced, anything "unsafe" any increased wear on sprocket or chains. As for snapping the throttle open or closed.... on a stock VTR doing that will unsettle this bike to the point of lost control and likely crash.. not sure how you quantify more then zero control and crash.. I had a '73 R75/5 that I had the flywheel lightened by Reg Pridmore. The starting weight was @ 10.2lbs. 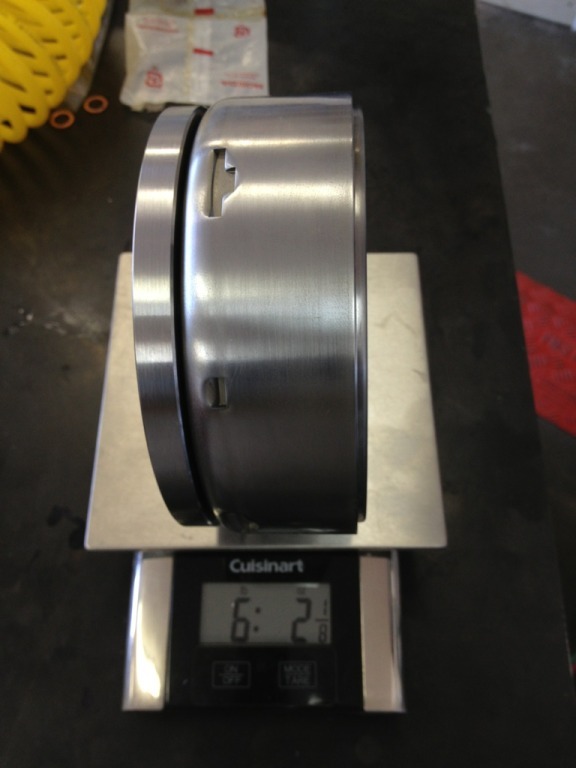 The finished weight was @ 5.7lbs. It had @ 102 new holes and looked like Swiss cheese. Operationally, the most notable difference was the quicker response when adjusting the load on the engine, both up and down. Hahaha, I made that sound like a horror story, didn't I! I was just trying to point out why on earth I thought Honda would even make it heavier, unless it was a direct move to reduce horsepower. I did point out that if you're riding correctly there is no downside. Not for the ham fisted, but I LOVE it....... response is immediate!!!!!! And would you need mine or do you do an exchange thing? Am I incorrect in my assumption though that part of the flywheels job and why it is as heavy as it is is to ballance the crankshaft as well? 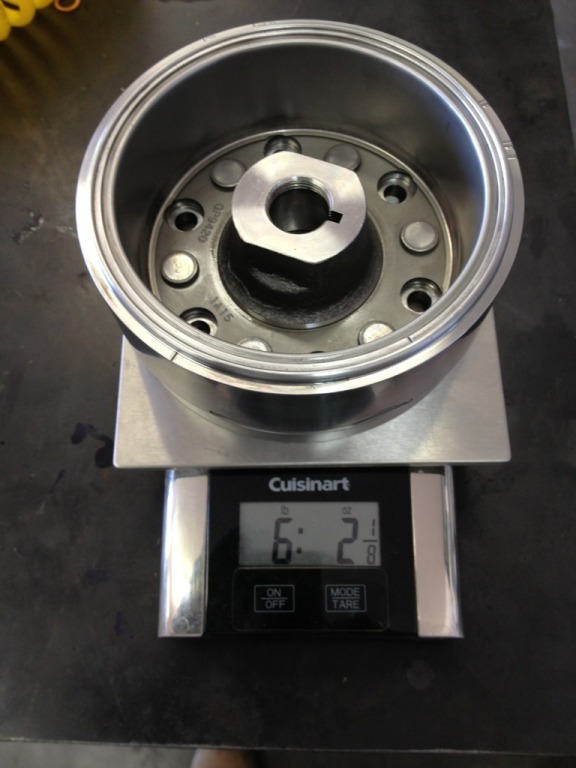 Which is also why even though they are all the same engine flywheels differ in weight slightly? 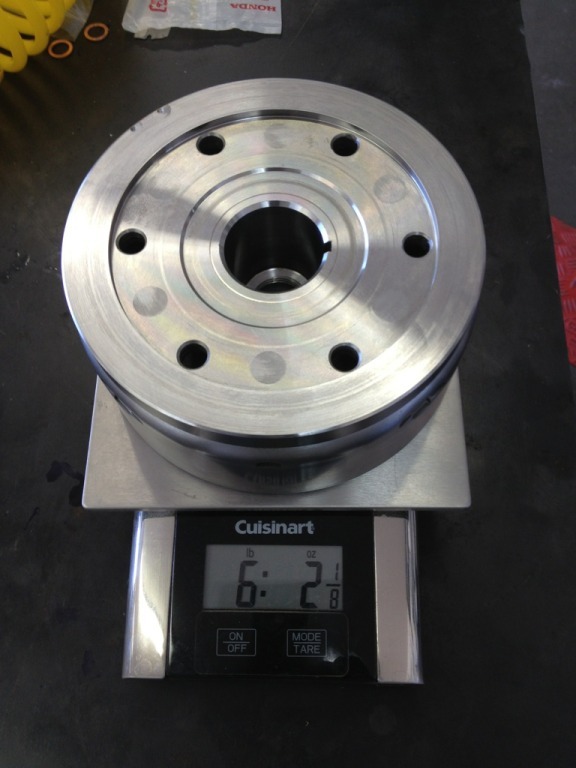 In more then 2 dozen flywheels reduced in weight from 10 oz to 1lb 5oz. No issues in REAL use have been found. I have over 13,000 miles on a lightened flywheel.. most of that in the 6.5k RPM to red line. Both my son and I ride my SH hard.... I did have another H4 light bulb filament break last week... but that's the only hard part failure I have seen in 38,000 miles. Lots of folks come up with lots of theory's, math, and unrelated story's about why this will not work... .. yet it works just fine, or has so far, perhaps my crankshaft will bust in two from unrealized harmonics this afternoon.. If it does,,, then i'll change my mind.. In theory, best is.. the entire rotating assembly is balanced as a unit.. In a production bike of low to medium end like the SH,, that's not being done. 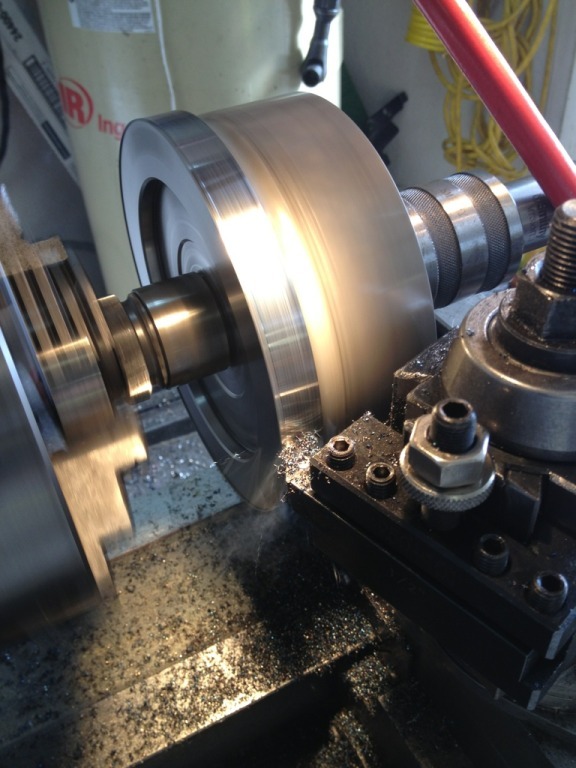 The crank shows machining to indicate it is balanced. 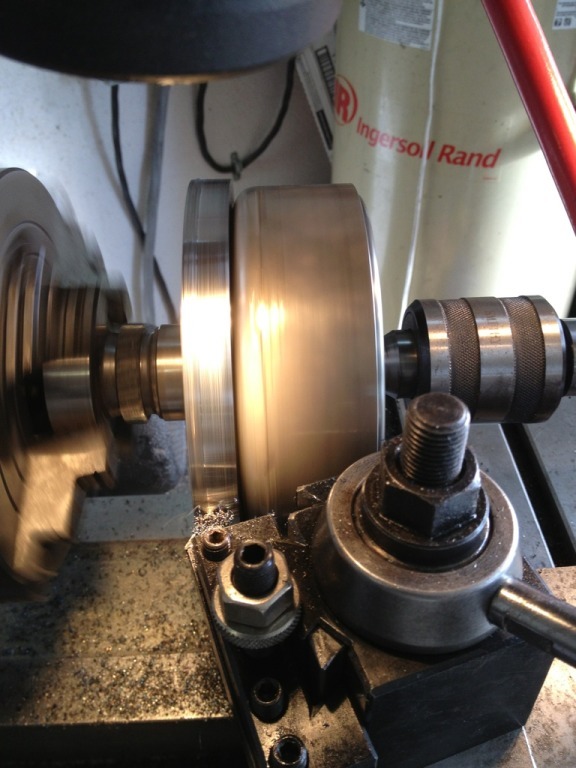 The flywheel shows machining to indicate it is balanced as an individual item. 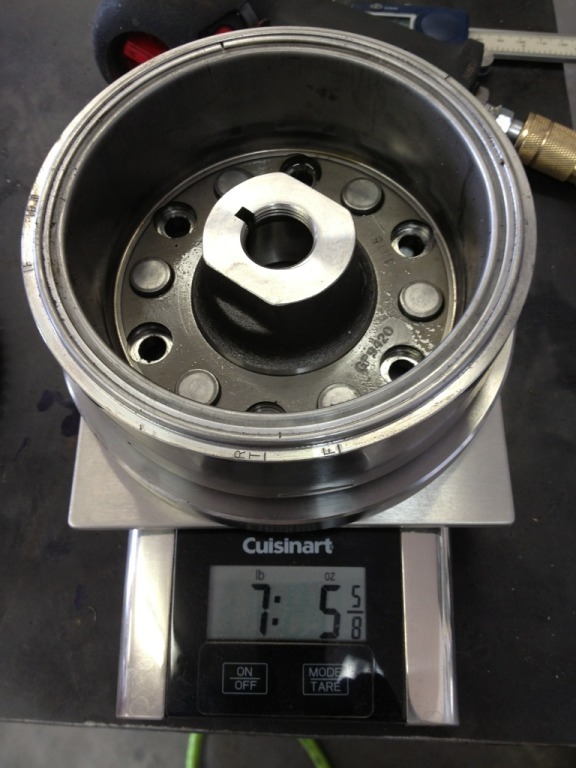 The flywheel is available as individual service item, as is the crank, rods, pistons. It's the same for every production bike I've ever seen service parts for. Yes/// we are changing the balance of the flywheel from stock.... No it seems not to cause any issues in actual real life use. Last edited by insulinboy; 11-09-2013 at 04:52 PM. I have a lightened flywheel fro H-Power here in Australia. When I fitted it I also removed the anti rattle gear from the primary drive as well as removed the water pump drive gear and chain at the same time as fitting an electric water pump. My goal was to reduce mass and now the bike spins up much quicker. To date after approx 20,000Klms there has been no ill effects other than a saw jaw from smiling too much when I nail the throttle! Another plus is the improved engine breaking. I did weigh the parts however it was a long time ago. I seem to recall that the difference was approx 2LBs. It changed the whole character of the engine. Much more lively and spun up heaps quicker, and engine braking took some time to get used to. I live on the south coast N.S.W at a place called Cambewarra. It is near Kangaroo Valley which has some great mountain roads to ride. I certainly don't regret this mod in any way as it achieved what I wanted which was better throttle response. Some may find that the throttle response becomes too touchy, but also owning an Aprilia shiver with touchy ride by wire throttle it isn't a problem for me. It would be interesting to put a standard bike and one with a lightened flywheel side by side and do a roll on test to see what happened! Of course there would be a lot of variables and I wonder if the results would validate the perceived benefits of the flywheel lightening. Either way I'm not concerned as I enjoy the change in engine character with the different flywheel. Are there any Dyno charts of before and after for this mod. Here in Australia for me Dyno time is very expensive at approx $400 a pop. The closest Dyno to me is 50 miles away and the guys with it are into IL4's in a big way, or Ducati and such! I bet it would, I did feel the difference and with your setup, I reckon it is even more so. I also wonder how much the exhaust sounds vary when flywheels are altered by differing amounts. I must admit that mine sounds different to what it did, the V effect is not as pronounced which to me is the only downside! Too many mods ago to remember what it sounded like in its original strangled form, however I heard a standard bike with Staintunes the other day and it sounded rougher and lazier. No exhaust note change that I have noted on my bike, or those I have installed a lightened flywheel on. Kenmore, so your sayin' that with all that weight taken off the rotating assembly, it became such a smooth engine, that it's hard to tell that it's a V-Twin? Last edited by CruxGNZ; 11-12-2013 at 08:42 PM. Reducing the flywheel or other rotating mass from the engine have nothing to do with the exhaust sound, except the rate of acceleration.